Rosemary Beach is a master planned, neo-traditional, self-contained community built around a Town Center with the concept of community, neighbors and convenience in mind. Located on the east end of Scenic Hwy 30A along the Gulf of Mexico. The neighborhoods in Rosemary are all interconnected to allow for pedestrian walkways and bike paths. High walk-ability is one of the big draws to Rosemary Beach. Erin Oden and Coastal Luxury specialize in the listing and sale of Rosemary Beach homes and condos. 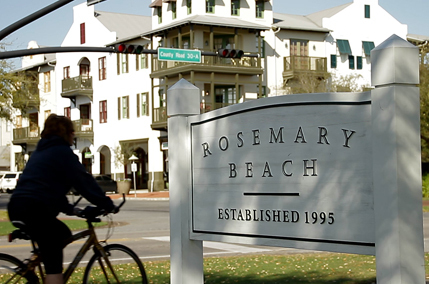 Rosemary Beach is a master-planned community along the eastern corridor of Scenic Highway 30A and the Gulf of Mexico. The Town Center is never more than a 5-minute walk from anywhere in in the community. Rosemary Beach is the closest neighborhood on 30A to the Northwest Florida Beaches International Airport. Rosemary Beach is approximately 23 miles east of Destin and 20 miles west of Panama City Beach in Northwest Florida. Rosemary Beach consists of single-family homes and condominiums. You won’t find two homes that are identical in Rosemary Beach, they are unique and designed to reflect each owner’s taste, but all homes conform to the overall vision of Rosemary Beach. The shapes and silhouettes of the homes are reminiscent of St. Augustine, the West Indies, New Orleans and Charleston. Finishes range from wood siding to cedar shakes or masonry stucco topped with metal or cedar shake roofs. Stern colonial elements juxtapose playful and unexpected details establishing a coastal character that is distinctively Rosemary Beach. Rosemary Beach offers private beach access, four pool areas, a Tennis Center and large expanses of green park space. Rosemary Beach is graced with 3000 feet of private beachfront on the Emerald Coast with nine beach access points. Western and Eastern Beach Greens provide wheelchair accessible ramps. Rosemary Beach offers four pools for year-round swimming. The beachside Coquina Pool features an infinity-edge design and is a great place for lounging. The park-side Cabana Pool is more suited for families with children. The Barbados Pool is conveniently located south of 30A and the year-round Sky Pool has heated water, radiant heating on the pool decking and a motorized roof that can be closed in cooler weather. The Tennis Center at Rosemary Beach have eight clay courts, six of which are lit for night play. The centre offers restrooms, shower facilities, a fully stocked pro shop, as well as an observation deck for spectators. Rosemary Beach abounds with greenspace and includes nine parks; The Western and Eastern Beach Greens, South Barrett Square and Playground Park on the south side of 30A, West and East Long Green Parks, North Barrett Square, St. Augustine Park and Rosemary Beach Butterfly Park on the north side of 30A.